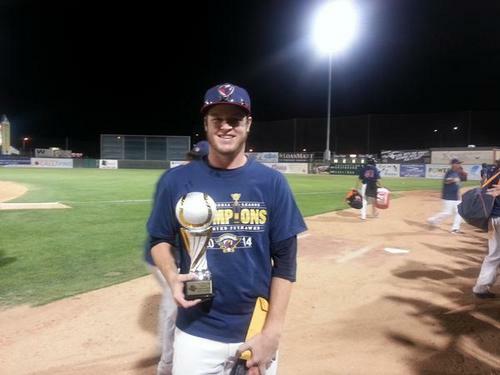 2011 Adirondack Trail Blazers alum, Tyler Brunnemann was lights out in picking up the win as his Lancaster JetHawks beat the Visalia Rawhide in the championship game of the High A California League. Not only did Brunnemann pick up the victory, he was named MVP of the Championship Series. In this 5th and deciding game, Brunnemann came on in the 5th inning, inheriting a pair of runners. After getting the first two batters to fly out, he struck the final batter of the inning. Tyler struck out the side in the 6th and k'd two out of the three batters in the 7th. The final stat line read like this; 3 innings pitched, no runs, no hits, no walks and 6 strikeouts. Brunnemann was a 40th round draft pick of the Houston Astros and has shown the other teams that passed on him that they missed a good one. Tyler also was selected earlier this season as a midseason Mid West League All Star while at Quad Cities. Brunnemann finished 2014 with a 1.90 ERA. In 33 games, he pitched 61.2 innings giving up 40 hits, allowing 15 walks while striking out 69 batters.